Try The Best Alternative to Apowersoft iPhone Data Cleaner! iPhone device users often have a need to delete their data. Sometimes, it could be as a result of selling the device to a new owner. At another time, it could be the need to maintain privacy and hide important or sensitive private data away from unscrupulous people. Thus, we now have such data cleaners as Apowersoft to erase data from iPhone. Many have used Apowersoft for the purpose of erasing their data permanently. 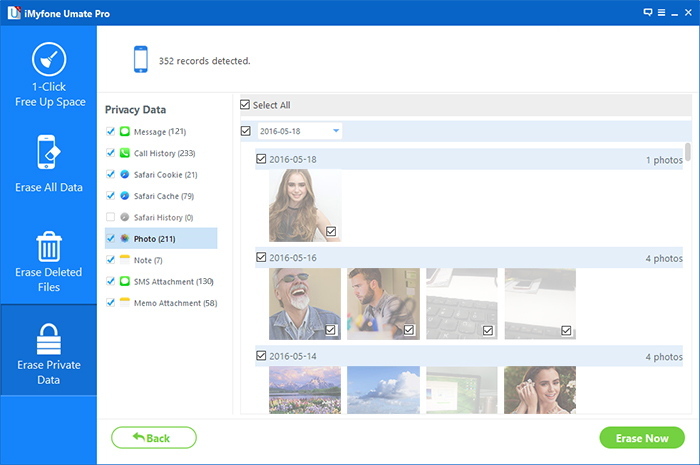 Actually, this software can wipe data from iPhone and some of it distinctive features include cleaning iPhone files such as photos, account passwords, contacts, and more. Apowersoft can be used to wipe data through 4 modes along with 3 erasing levels, and it supports all the major iOS devices like iPhone, iPad, and iPod. Though the manufacturer states that the software can permanently delete your data from iPhone and prevent them from being recovered, some users have had reasons to doubt. Some have encountered problems when using Apowersoft, and many have not been able to delete their iPhone data permanently as they wanted. Even this writer did not get to enjoy those features that are attributed to Apowersoft. It becomes frustrating sometimes when you want to delete private data from iPhone, and you later discovered that the data are still hiding somewhere in your iPhone. Therefore, this writer and some iPhone users have had to look for a better alternative. But, is there any and better alternative? With this, you no longer need to worry when you want to sell your device or fear that the repairer will gain access to your personal information when the need arises to repair the device. But, there are more reasons why iMyFone Umate Pro is the best alternative to Apowersoft. Let us look at these. Multiple Functions: iMyFone Umate Pro comes with many functions that every user will enjoy. It can be used to erase data, files, photos, calendar, contacts, and others. Unlike other tools out there, Umate Pro gives you more options to use it for. 3 Erase Modes: The software comes with 3 powerful modes - Erase All Data, Erase Deleted Files, and Erase Private Files. All of these can be used to fit a particular need. For instance, if you want to permanently erase a previously deleted file with no chance of recovery, apply "Erase Deleted Files" mode. Support Different Type of Files: Umate Pro supports all iOS files. So, you are never limited to using it for a particular file. This is one feature that Apowersoft do not have, especially third party app data, like WhatsApp, Viber, SnapChat, WeChat, etc. It is the first one and the only one eraser to support third party app data. Completely Unrecoverable: Once you erase a deleted file with Umate Pro, it cannot be recovered again. When you use iPhone erase feature, or you use another software to delete, the file or data can be recovered with a recovery tool. But, data cannot be recovered once iMyFone is used. Preview and Choose: Umate Pro gives you an opportunity to preview a file and choose any erase mode that applies. You cannot delete by accident. You can choose before you delete. Erase Current and Previously Deleted Files: As mentioned above, Umate Pro will delete previously deleted files. It can also be used to erase a current file permanently. Easy to Use: Umate Pro has no complexity around it. It is very easy to use for everyone. It has a detailed guide as well that new users can follow to delete files. The process of using iMyFone is neither cumbersome nor confusing. The above unique features set iMyFone Umate Pro apart from Apowersoft. And as already stated, Umate Pro is very easy to use. Just look at the using steps below. Step 1. Download and install iMyFone to your computer. Then connect your device to the PC with a cable. Step 2. Select applicable erase mode and scan your device. Step 3. When the scan analysis appears, click on a file or data to be deleted. And click Erase Now. Then input 'Delete' into the box that appears and confirms your intention. And the file data will be permanently erased. As you can see, Umate Pro is far ahead of others in term of reliability and efficiency. Would not you rather use it?